Scotland defence coach Graham Steadman is anticipating some colossal collisions in Saturday's must-win World Cup Pool B bout with England and is backing Andy Robinson's men to prevail. Steadman is the man who must mastermind a defensive strategy to cope with England's fearsome strike runners, including Manu Tuilagi and Chris Ashton, as Scotland seek to win by eight points or more - thus denying their neighbours a losing bonus point - to advance to the quarter-finals. While aware of the threat England pose, the Yorkshireman, a former Great Britain rugby league international, is backing Scotland to cope. On the midfield battle in particular, Steadman expects the collisions to be "massive", adding: "It will be good viewing." 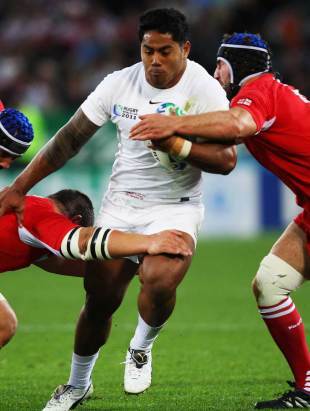 Samoa-born Leicester centre Tuilagi has scored four tries in five Tests for England. "We'll pay him attention, we know what he's about," Steadman said. "He is a threat if he gets a bit of momentum off quick ball, so we've got to get up and stop his momentum. The personal battles against that particular player we've got to make sure we come out of on top, because if he gets a head of steam he can cause problems. "It's going to be an interesting match-up but whichever pairing we go with in midfield, I'm sure they'll do a solid job for us." Scotland are set to name their team at 0900 local time on Thursday (2100BST on Wednesday), with Graeme Morrison poised to line-up at inside centre and Nick De Luca, Joe Ansbro and Sean Lamont in contention to join him in the midfield. Tuilagi is set to line-up alongside Mike Tindall in the centre for England and the duo will run hard and straight at Scotland. Steadman added: "We've got our own little game plan in place to try and cause them one or two problems and we know if those two guys are allowed to get a bit of space, with a view to playing off the front foot, we're going to be back pedalling a little bit." Steadman is also wary of wing Ashton, who scored a hat-trick in the 67-3 win over Romania. He added: "They've got the strike power of Ashton, who has not fired on all cylinders to date and he'll be looking for a big one at our expense at the weekend. "I know he scored three in his last outing - we may say it was against inferior opposition. Without being disrespectful to the Romanian boys, I'd like to think they're not going to get the same kind of space they were offered against their last opposition. "There are going to be a number of questions asked, but I'd like to think we can trust the systems that are in place." Steadman also recognises England fly-halves Jonny Wilkinson and Toby Flood offer different threats which Scotland must be able to nullify. Steadman believes the breakdown will be key on Saturday and an area where Scotland must perform. "That's where the game's won and lost in terms of momentum," he said. "It's something we pride ourselves on and we know we can't afford to let them get a head of steam on because off the back of that they've got a backline that can certainly pose problems." Scotland last beat England by eight or more points in 1986. In the 25 years since, Scotland have won four times - in 1990, 2000, 2006 and 2008 - all by a six-point margin and all at Murrayfield. There are many permutations, with England, Scotland and Argentina, who play Georgia on Sunday, all in contention to advance to the last eight. Scotland, though, are focusing on the result, first and foremost. "We can't look too far in front of where we are at this moment in time," Steadman added. "We know what's required, but we've got to get the victory first and if the scoreboard takes care of itself, having played well for the 80 minutes, we can come off the field happy." Scotland scored four tries against Romania, but did not cross the whitewash in the rain-soaked matches with Georgia and Argentina. Steadman added: "We've just got to be a little bit more clinical with the opportunities we create. "If we're not clinical we'll be looking at the worst-case scenario which I don't even want to think about." Gloucester second row Jim Hamilton is a doubt for the match with a knee injury and Saracens No.8 Kelly Brown is undergoing concussion protocols following a head injury sustained against Argentina. Richie Gray is making good progress following a hamstring problem and could be joined in the second row by tournament captain Alastair Kellock if Hamilton fails to recover. Euan Murray is likely to return at tight-head prop after missing the Pumas fixture as it fell on a Sunday.